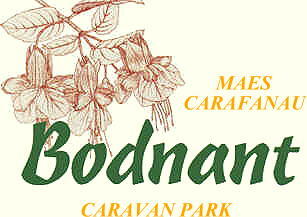 Gift vouchers available to treat family or friends to a stay at Bodnant Caravan Park 2019. Tocynnau anrheg ar gael ich teulu neu ffrindiau i aros yn Maes Carafanau Bodnant yn 2019. 15% off the basic price of your stay for 4 or more consecutive nights. All nights must be paid for in advance. 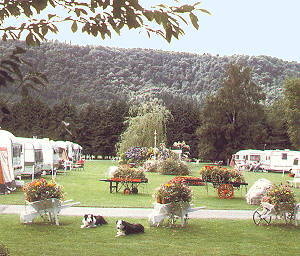 Bodnant Caravan Park was established in the early 1960's by the Kerry family, a local Welsh speaking farming family. We have won the 'WALES IN BLOOM' competition covering the whole of Wales, for touring caravans for 26 consecutive years with our many floral features and an array of old farm implements of a bygone era. We featured in the Practical Caravan Top 100 Sites 2011 (17th for touring caravans and 21st for motorcaravans), and 2012, 2013, 2014, 2015, 2016, 2017 and 2018. 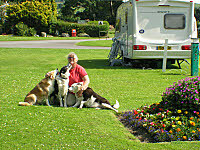 We can accommodate touring caravans, motor-caravans and tents. We also have 2 holiday caravans for hire. We have a separate field for caravan rallies. 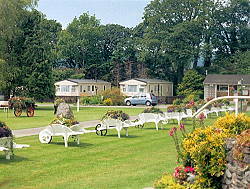 Bodnant enjoys a picturesque location on the outskirts of the market town of Llanrwst in the beautiful Conwy Valley. Many customers return year after year to enjoy our gardens and relaxed, friendly atmosphere. Our site is renowned even as far as Europe. The site is all level, easily accessed, sheltered by trees and bordered by Nant y Goron stream, which runs into the River Conwy. 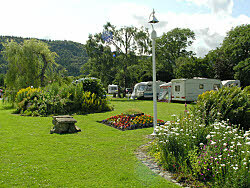 All 35 caravan and motor-caravan pitches are hard-standing, multi-service pitches. 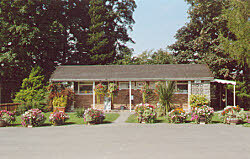 The site is situated within 10 minutes walking distance from the town, opposite the Leisure Centre on the B5427 Nebo Road from Llanrwst, and is clearly signposted at the junction with the A470 (see map on area page). View our access statement for information on access to our caravan and camping site for those with disabilities. All 35 caravan and motor-caravan pitches are hard-standing, multi-serviced pitches with 16 amp electric hookup, TV hook-ups, water taps and grey waste disposal. Pitches are either hard-standing or grass. WiFi is available on the site at a charge. All 14 tent pitches which are in a separate field have electric and TV hook-ups. 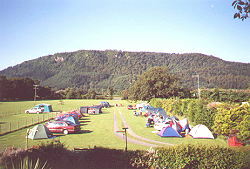 Most tent pitches with the electric hookups are approx 9mx9m. Please note we cannot accept tents larger than 5x6 metres including guide ropes. The toilet blocks have free hot water and showers. 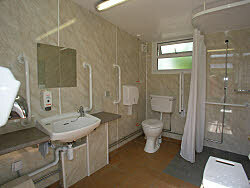 The larger toilet block is heated. There is also a block with disabled facilities. A covered dishwashing area, chemical disposal point and a recycling collection area, small playfield and dog walk are also provided. The main gates are locked to vehicles between 11pm and 8am. Loud noise is not permitted after 11pm. We also have a small farm stocking sheep, hens, ducks and guinea fowl. Our site is well known for our animal cemetery, marked with little white crosses where children often leave posies of wildflowers.